Cross-posted from Emily 's blog, West of the Loop. 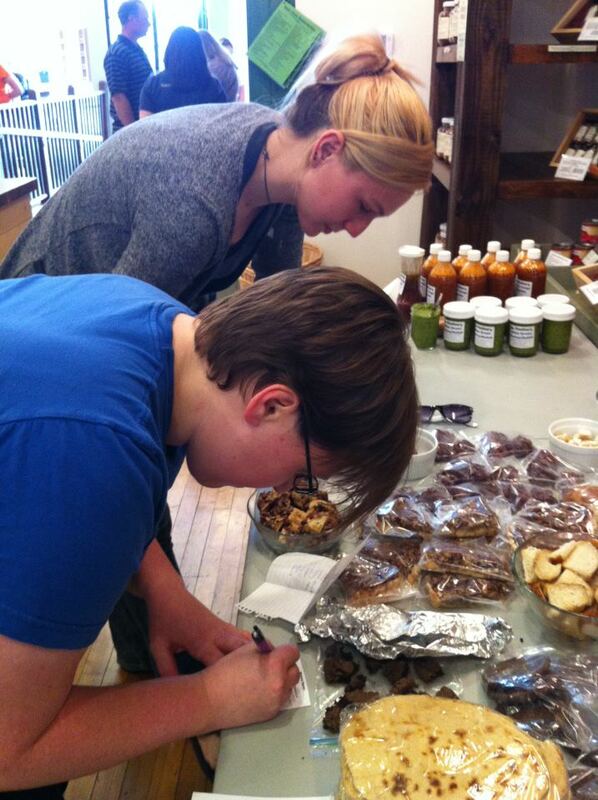 The third Chicago Food Swap took place last Sunday, June 3. It was our biggest and best swap yet! We had a new location and a lively mix of veterans and first-time swappers. Not surprisingly, the range of offerings was more diverse than it had ever been before. 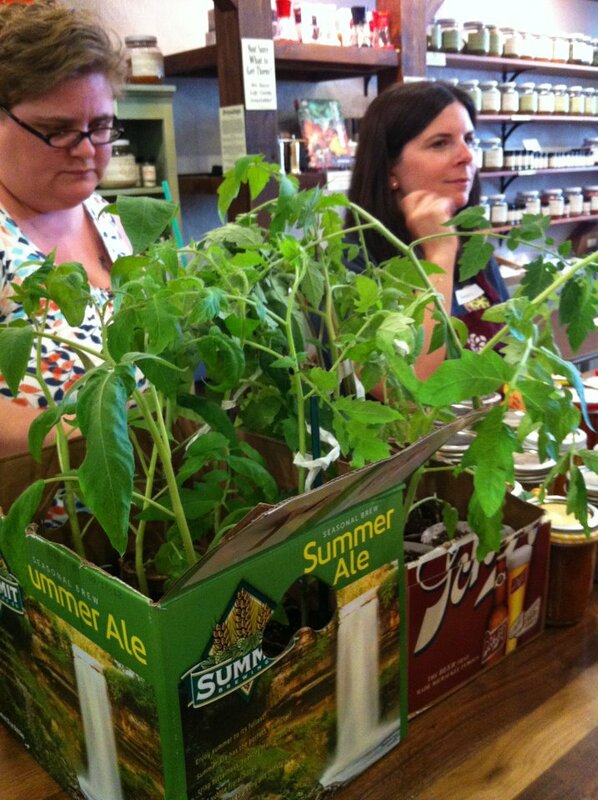 We even had our first homegrown (as opposed to homemade) items: a bunch of heirloom tomato plants that two first-time swappers had raised from seeds. The veteran swappers were happy to see one another again and excited to see the wider range of swap items. And the first-time swappers were delighted by just how fun it was. Everyone one of them said that they want to do it again. So be warned: if you come to one of these events, you will be hooked. 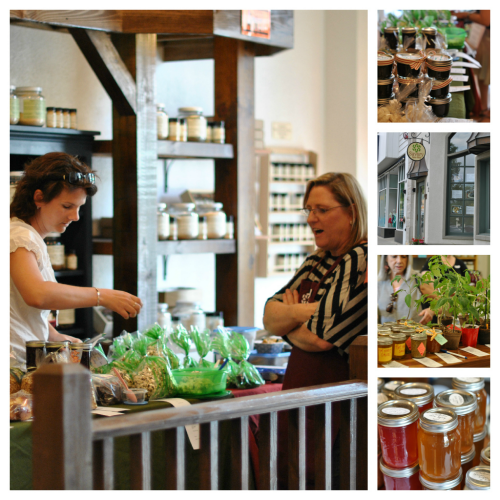 Our host for the June Swap was the Savory Spice Shop in west suburban Hinsdale and we could not have asked for a better location. While we loved having the swaps at Pretty Little Things in Forest Park, Vanessa and I feel strongly about moving the swaps around the Chicago area to attract new swappers. One of the owners of the Savory Spice Shop, David Trout, had read about the Chicago Food Swap online and reached out to me about the possibility of hosting. 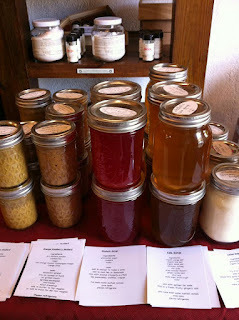 My co-founder Vanessa went out to Hinsdale to see the store and she knew right away that it would be an ideal location. 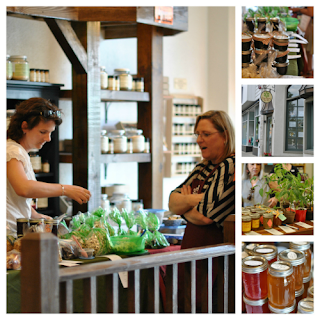 The store is big and bright and located right in charming downtown Hinsdale. Plus, the idea of swapping home-baked goodies surrounded by jars of fragrant spices and herbs just felt right. Our hosts, David and Angel and Dianne went out of their way to get the shop ready for us: putting out long tables and clearing off shelf space. I think it worked out pretty well for them too — I don’t think a single swapper went home without buying something. What cook could resist? I am amazed that I only bought peppercorns, candied ginger — for a rhubarb buckle I am planning to make this week — and the most fragrant True Ceylon Cinnamon that you can imagine. We had approximately 25 swappers there, which was an all-time high. Many of the swappers from our April Swap returned, and we were delighted to see them. It was helpful to have some veterans on hand who know how the swap works and, of course, it is gratifying to see that people enjoyed themselves enough last time to want to return. But most exciting for me and Vanessa was to see all the new faces. I asked some of our first-time swappers how they found us and it was great to hear how the buzz is building. Not surprisingly, with 25 people, there were a lot of delicious goodies to swap for. I brought 5 jars each of two kinds of chutney, kiwi-apple and mango, and 3 bottles of a drink syrup made out of rose petals from my garden. (It’s surprisingly fruity and delicious.) I went home with 6 whoopie pies, a homemade cola syrup, lemon sugar (! ), three different jams, cake batter truffles (yum! ), blondie bites — my husband’s favorite — pickled carrots, bread-and-butter pickles, Indian green chutney, some spicy homemade salsa and a doomed heirloom tomato plant. We’ve already polished off the baked goods, the pickled carrots and the salsa and it was all delicious. Among the things I didn’t get were various kinds of fudge, tons of homemade baked goods ranging from tortillas and bagels to meringues and whiskey cake, other drink syrups and jams, mustards, more homemade limoncello — one of the hottest items last time around — granola, hot fudge sauce, chocolate bark, chocolate-covered popcorn and so much more. You could see people swapping inspiration and ideas along with the food. The best part of these events is not the delicious food that we all go home with — although that is nice — it is seeing passionate home cooks come together and enjoy being around other like-minded people. We are already planning the next Chicago Food Swap for August 26. We will be featuring a special guest, Marisa McClellan of the amazing canning blog Food in Jars, who will be signing copies of her new cookbook. Marisa has tons of fans so I expect it will be packed. We are still finalizing the location, so stay tuned to our website or Facebook page for more information and to be the first to sign up. 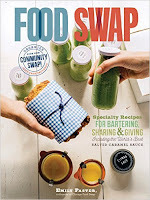 Want to hear more about how the Chicago Food Swap works? Several of our swappers have written about it on their blogs, including Rowena, Melisa and Tracey. If you don’t believe all the good things I have to say, maybe you will believe them.